Here I am, after a break for a long time... almost couple of months. I have been coping up with some health issues, traveling and engaged in refurnishing of house. With everything done now, I am back with full energy, enthusiasm, a newly furnished house and loads of recipes to share with you all. All this while, even though I was not writing I did a lot of baking and just can't wait to share with you all the different things that I have tried my hands at. One of the various things I tried for the first time in these past couple of months is French Macarons. Yes... maiden attempt and fairly succeeded! 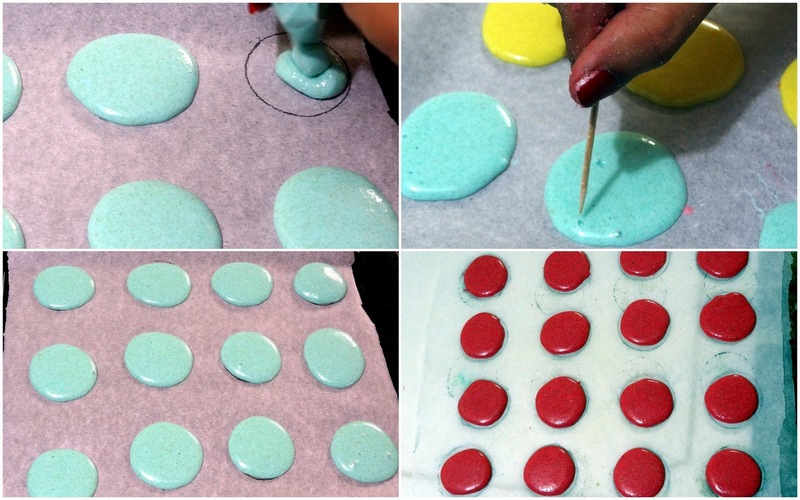 Making perfect French Macarons is the dream of every baker. I started, keeping my fingers crossed, hoping to make my first Macs perfect. All the ingredients here are given by weights. It is important for a successful macarons to have all the ingredients measured with a digital weighing scale. Believe me, this investment would be worth every single penny. 1. Line 3 baking sheets with parchment paper and draw a template of 15 circles (3X5) of 1.5 inches or 3 cm in diameter each on parchment paper the size of your baking sheet. 2. Sift together icing sugar and almond flour in a medium size bowl and keep it aside. 2. 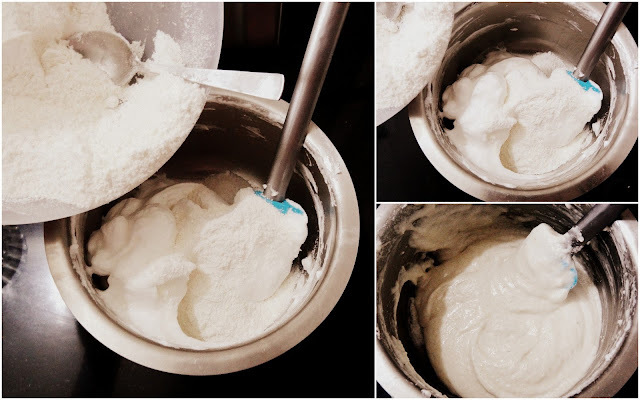 In another clean and dry bowl, add egg whites and cream of tartar (optional) and beat with your hand beater or stand mixer using whisk attachment until foamy. 3. Gradually add caster sugar in the egg white mixture while beating it. 4. 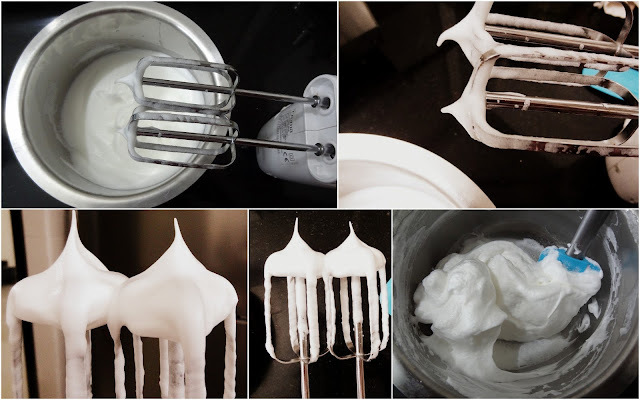 Once all the sugar goes into the egg whites, beat the egg whites for 3-4 minutes until you get stiff straight peaks. Care should be taken not to over beat the egg whites. Keep checking for the stiff peaks and stop once u get the straight peaks like shown in the picture above. 5. Add the dry ingredients i.e. mixture of almond flour and icing sugar into egg white mixture in 3 additions. Mix the dry ingredients well after each addition. Do not worry if the air incorporated in egg whites is vanishing, you want some of the air to go off the egg whites. At the end, you will get a paste like mixture smiling back at you with a gloss. And yeah..... you are done! 6. Time to tint the batter with you favourite food colour. I divided my batter into 3 parts and coloured them blue, yellow and pink respectively. This step is absolutely optional. Add the food colour drop by drop and see if you are happy with the colour. You simply need to follow your instincts for this step. Cool.. ..isn't it? 7. Pour each of these different coloured batter into three disposable piping bag or ziplock bag and snip off the end of the bag. Put the template below the parchment paper on your baking sheet and pour the batter into the circles drawn on template. Try to pour the batter within the circle as the batter has some tendency to spread. 8. Remove all the air bubbles from the batter by either tapping the baking tray or break the bubbles with the help of tooth pick. Let the macarons sit in the baking tray sit for 30 - 60 minutes. In the meanwhile, pre heat your oven to 160° C/ 325° F. Bake the macarons for 14 - 16 minutes, rotating the sheet front to back about halfway through the baking. 9. The macarons are done when you can barely remove the macarons from the baking tray. There will be a little browning on the corners of the macarons. If you see the bottom of the macarons brown too much, you can line baking tray with sheets of two parchment papers. 10. Remove the macarons from the oven and let it cool completely on the baking tray kept on a wire rack. 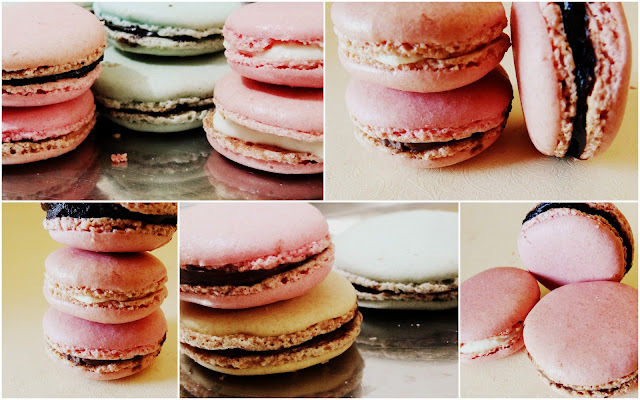 To assemble the macarons, take two similar size of macarons and sandwich them together with your favourite filling. The best choices of filing are lemon curd, chocolate ganache, swiss buttercream, nutella or jam. While the macarons can be served the day they are made, the best of flavours come out the next day. These cookies need to mature for a day or two in the refrigerator. Serve at room temperature. I filled my macarons with dark chocolate ganache, white cocolate ganache and nutella. Everybody simply loved it. Hope you also making macarons as much as I did! Don't forget to share your experience with me, leave your comments in the comment box below. I would love to hear back from you all.